Today, I discovered the Wee Tiny Roller Skate Sock by Meg Bakewell, and it was love at first sight. Seriously. Have you ever seen anything so adorable in your life? The tiny wheels really seal the deal. 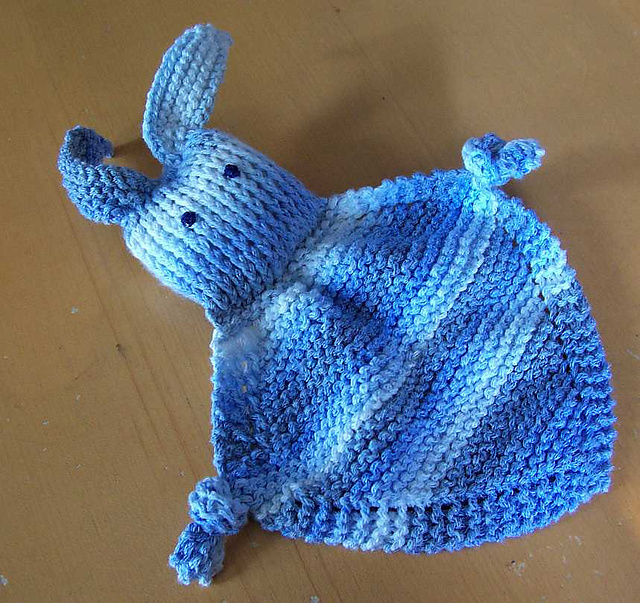 I cannot wait to knit this little skate. It will be a fine replacement for the stolen tiny sock. 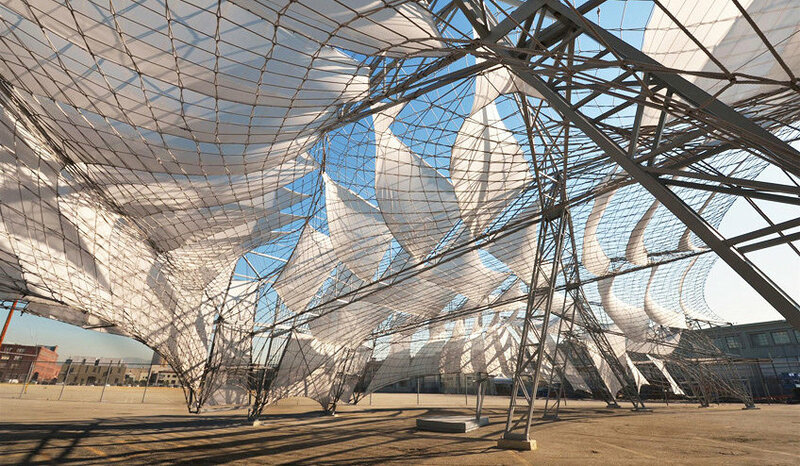 The Southern California Institute for Architecture constructed a pavilion in their parking lot for a graduation ceremony – and they did it by knitting! For the video of the process and more information on their project, CLICK HERE. After I lovingly stitched this up, I proudly presented it to Richard so he could tell me how fabulous it is. Instead, he told me it looks spooky. 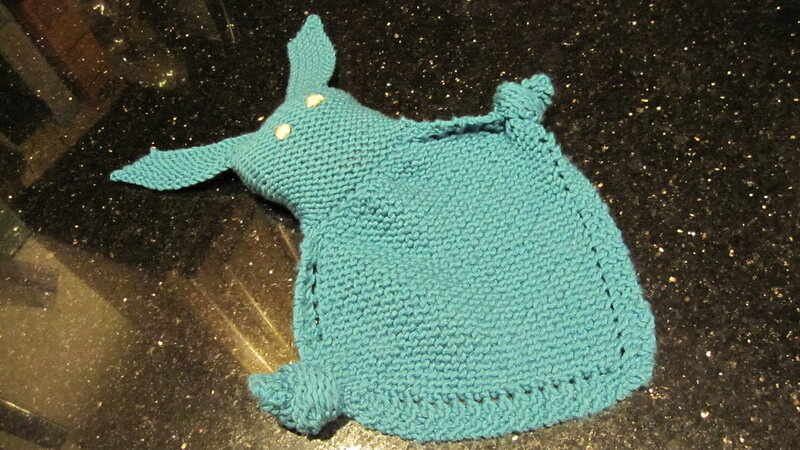 This confused me because I knit it exactly to the pattern specifications. It’s the Blanket Buddy by Mary Ann Thompson. See? They look the same! Do they look spooky? Do I need to add a mouth? Or would it be less spooky if the eyes were black? I appreciate any knitterly advice you can offer. In other news, Clark’s mom is a saint and she wants me to send his dyslexic hat to him just the way it is. Now I’m casting on a special anniversary gift for a friend while watching Rachel Zoe on QVC. Can’t wait to show you all! After a rather hectic afternoon, Richard and I set out to meet the Yarn Harlot at her book signing in Skokie yesterday. I have loved Stephanie Pearl-McPhee‘s Books and Knitting Blog ever since I became a knitter, and I figured I had better take advantage of the rare opportunity to meet her. I am pleased to announce that Stephanie is exactly the same in person as she is in her books: funny, honest, and a really grounded person. 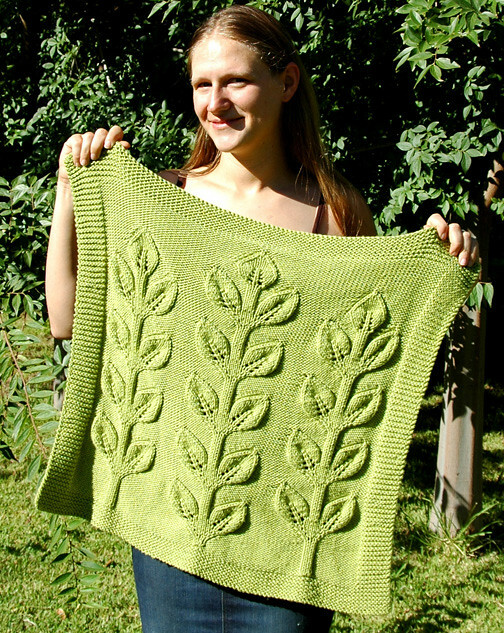 Her perspective is endlessly refreshing and entertaining; she must be a riot at knit night. She began the session by reading some excerpts from her new book, All Wound Up. Her new book is really funny and just as good as her other books. It was so fun to hear the new stories and adventures she had chosen to share with us. There is something really special about hearing an author read their work. I can’t explain it. I felt the same thing when Franklin Habit came to the Windy City Knitting Guild and read from It Itches. It’s a magical experience you really shouldn’t miss. Is it because you are seeing the author’s expressions and hearing their inflection so the story is being read exactly as it was meant to be heard and not changed by our own personal moods or perspectives? I’m not sure. Richard sat with me throughout the reading and we laughed together with her stories. His assessment when she finished is that she is funny and he enjoyed listening to her speak. This was excellent news, because we sat in an hour of rush hour traffic to get there and he was starving and I was really worried he would have a bad time because he was the only non-knitter in the place. Then she opened the session up to a quick Q&A Session and she told us a little about her writing process, the sweater she’s knitting, and her family. She told us one of her daughters is moving into her first apartment this week and that’s the moment that my heart tugged a little. We were so lucky that she was here with us. Because, really, traveling to twelve cities in fourteen days sounds glamorous; but I cannot even imagine being away from my family for so long, travelling all by myself, and sleeping in a different place every night. It must be an exhausting, lonely and emotionally draining trip for her and it’s a really a testament to her good nature because she shows up with a smile on her face and a kind word for everyone. The book signing began and Stephanie asked everyone to let anyone who HAD to go, cut in front of the line without question and regardless of their number because that’s the way the world would be if Knitters ruled the World. I like thinking about Knitters ruling the world and I am fortunate enough that I could wait, so I kept knitting. 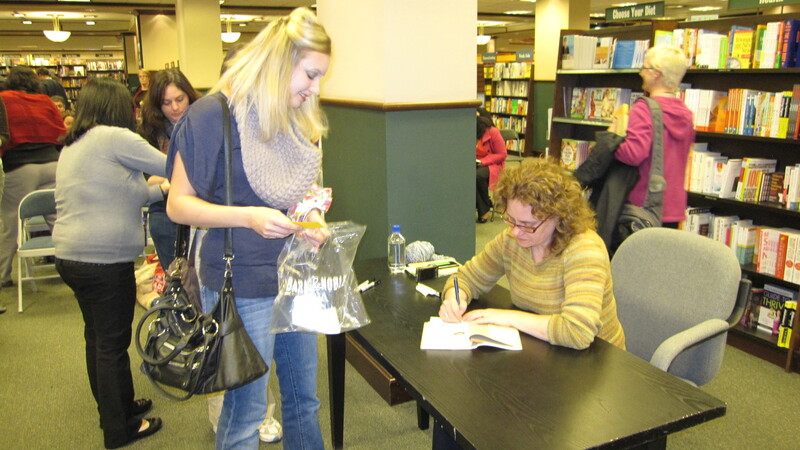 When my number was called I walked up and Richard took a photo of her signing my book. I was really excited we caught a photo of this because it is definitely in my Top Five Moments of 2011. 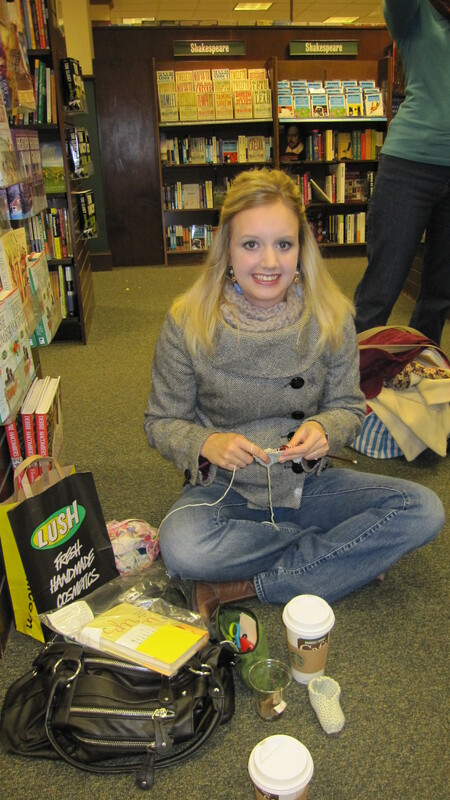 One of my favorite things about the Yarn Harlot is the way she so honestly portrays her life as a knitter. 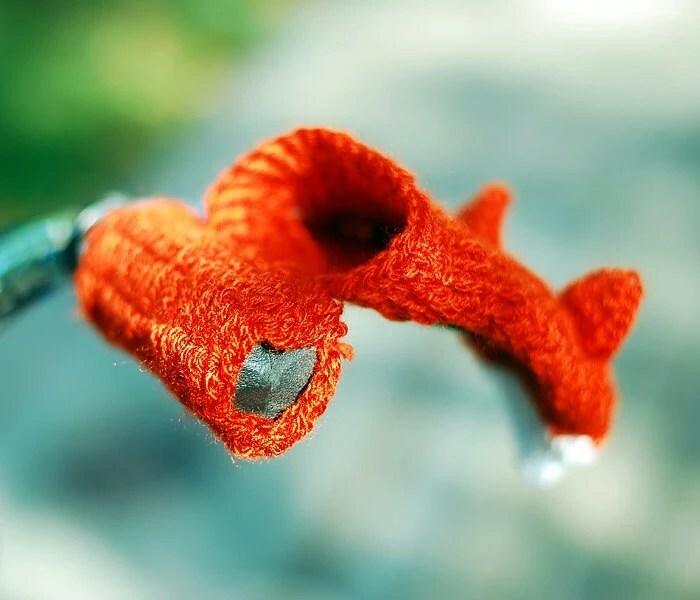 Her blog is awesome because I can actually RELATE to it and she shows the entire process of a knitted item, including the mistakes we all make. Inspired by her sweater saga, I thought it would only be fair if I shared my latest knitting blooper with her, so out came the dyslexic Clark hat. After a delightfully exciting night of knitting, talking about knitting, and meeting the most famous knitter on the planet, it was time to feed Richard. So we walked over to The Bagel where Richard was able to indulge his craving for Mish Mash Soup. 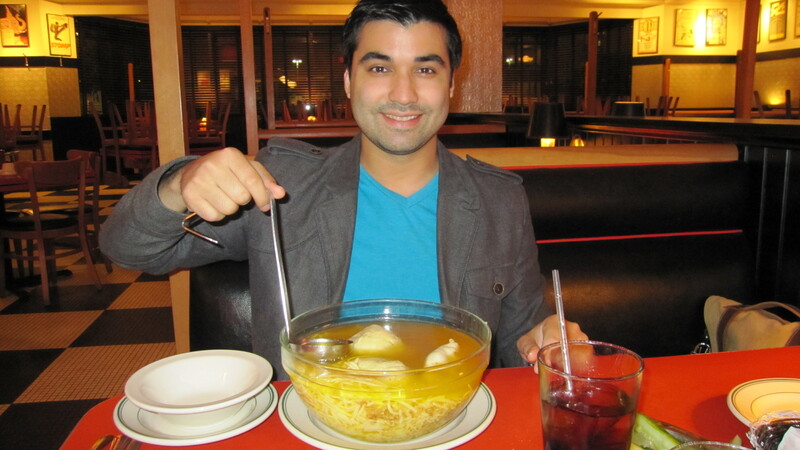 I will never understand how he can consume a bowl of soup this large. 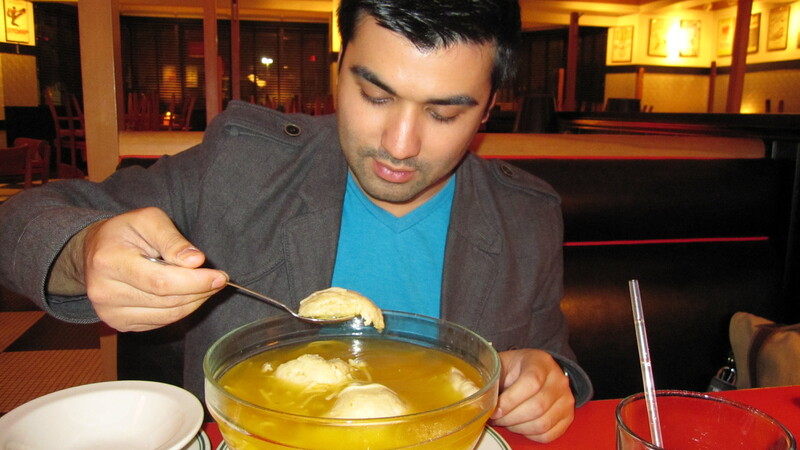 They even had to give him his own ladle. If you would like to see the Yarn Harlot’s post on her visit to Chicago, CLICK HERE. And if you met her on her tour this time around and blogged about it, leave a link in the comments so we can all read about it! And now I have to go do the paperwork I’ve been avoiding all day because knitting is more fun than paperwork. 1. Recently someone I love very much had a baby boy named Clark. 2. He is REALLY cute. a) He is already here = My gifts are late. b) He lives in Alaska and I have NO IDEA how long my tiny gifts will take to get there. 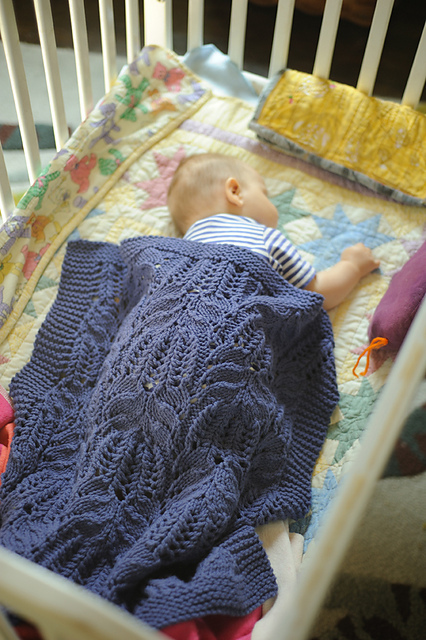 c) His mother is a knitter, so a simple basket weave baby blanket just isn’t going to be good enough. 5. Do you have any good baby boy knitting patterns I should know about? Richard looks over tentatively to assess how bad the situation is. He knows knitting emergencies can get ugly. Me (glaring): “That is NOT okay.” I continue to stare in horror at the offending hat. 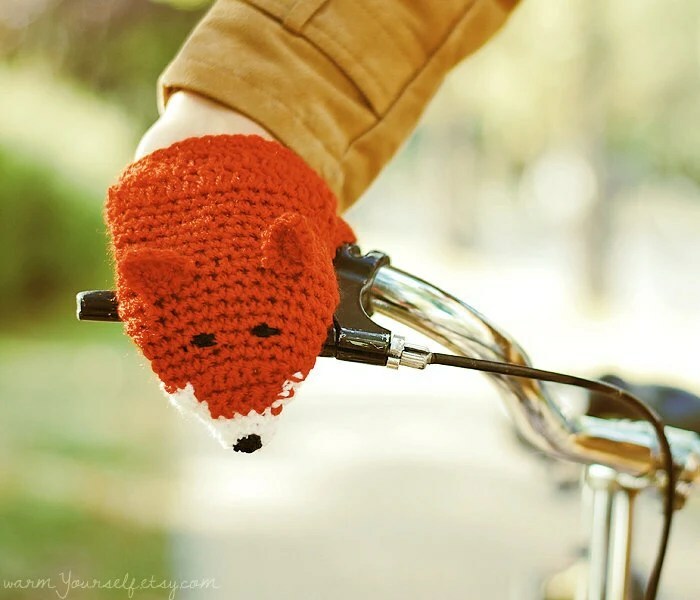 I glared at Richard, put down the hat, and cast on some pom pom baby shoes to take the edge off. 8. The Pom Pom Baby Shoes turned out really cute. 9. I am meeting the Yarn Harlot today. I am SO EXCITED! 10. I am REALLY concerned about what the heck I’m going to wear. I know it’s silly, but I can’t help it. 11. I wonder if I should ask her to sign ALL my Yarn Harlot books, or just stick to the new one? 12. Richard and I are probably going to leave really early because I want to get a good seat for her talk. 13. I haven’t told him this yet, but Richard is probably going to be the only non-knitter there. I hope he’s prepared…. Are you looking for the perfect knit accessory to update your fall wardrobe? Ovate by Tori Gurbisz is it! 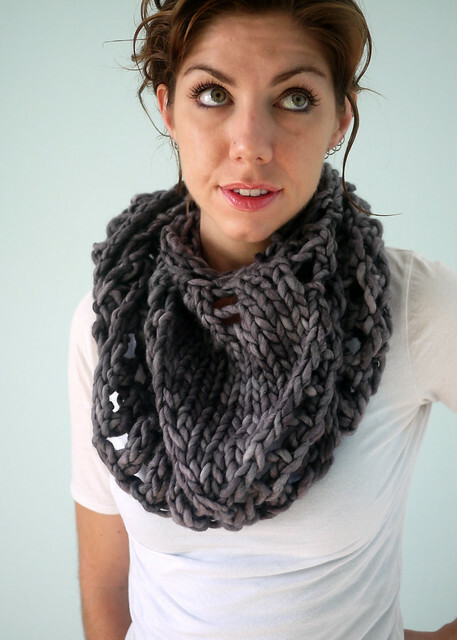 It’s a quick knit and a very versatile piece. 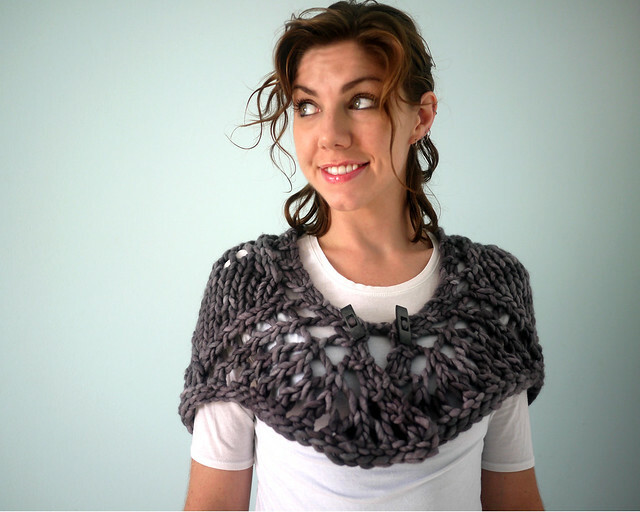 You can wear it open, buttoned, or as a cowl. I love the elegant shaping in the front. 🙂 Tori is so talented! This is so beautiful. 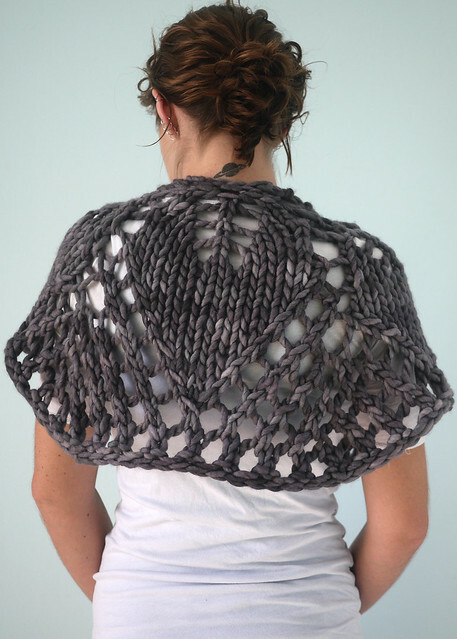 The question isn’t SHOULD you knit Ovate; it’s how many colors should you knit it in? Yarn Harlot is Coming to Chicago! I am so excited to buy Stephanie Pearl-McPhee’s new book, All Wound Up! Stephanie is coming to the Barnes and Noble in Skokie, IL to sign copies of her book and she will speak about this new collection of essays. You can find more info HERE. 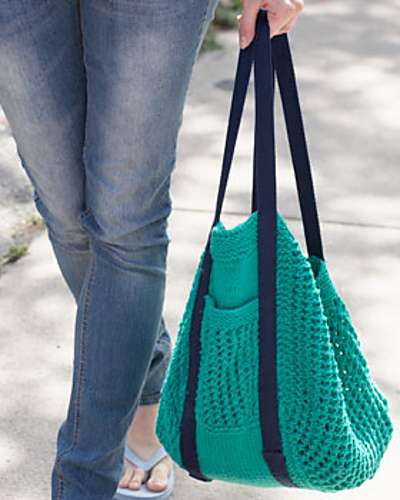 Have a cool knit to share? Leave a link in the comments!